Max ASP delivers best-in-class direct sales capabilities to compliment your existing sales organization resources in order to increase customer coverage and sales revenues. This is generally founded on a strong Inside Sales and Field Sales collaborative model, with shared customer territory responsibilities and revenue targets. Our Inside Sales teams drive “transactional” sales activity based on fast quote response, closing the order and high quality account management. In parallel our Inside Sales teams can generate leads for high value and complex products and solutions for their Field Sales colleagues to follow-up and close. We can also focus on a specific group of customers or product lines which your sales organization is not able to currently address. This may be because your customer base is too large or very complex or you want to launch new products and gain market coverage quickly. In this and other scenarios Max ASP can rapidly extend customer coverage in order to generate incremental sales within a highly efficient cost model. 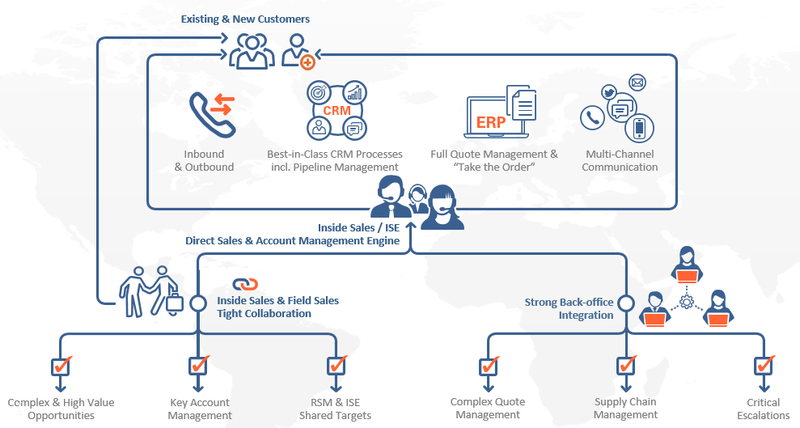 This direct sales capability is strongly underpinned by your existing ERP and Max ASP’s best-in-class CRM capabilities. A baseline of existing customer data, including current sales and product installed base information, next to our on-going focus on data enrichment and data driven sales activities, are critical factors for success.